Additional information on WANG’s Position Statement is posted here. The West Austin Neighborhood Group has been heavily involved in the Brackenridge Tract matter since the University of Texas System announced its intent to reevaluate the Tract in 2006. We have had the opportunity to review the portion of Cooper Robertson & Partners’ suggested master plans that have been made available to the public. We have also had extensive discussions over the last several years with a variety of stakeholders, both before the master plans were released and afterwards. Our immediate objective is to see that the University of Texas System does not adopt either of Cooper Robertson & Partners’ master plans for the Brackenridge Tract. Our secondary objective is to find a permanent solution to questions of future development of the tract, to minimize its impact on the West Austin community, to protect the critical open space that Muny represents and to preserve such critical community resources as WAYA. We believe that this can be done in such a way as to benefit the University of Texas as well. The 1989 Brackenridge Tract Development Agreement was a hard fought compromise hammered out between community stakeholders, the City of Austin and the University of Texas. It served the needs of all parties at the time. For all the good that it did and for the structure it gave development of the tract over the last 20 years, it did not create permanency. In December, 2009, the Board of Regents voted to keep the Brackenridge Field Labratory open. While we, the College of Natural Sciences and the Faculty Council concur that this is a very positive outcome, the Regents’ motion, as approved, states that the future of the Field Lab will be reviewed again in 10 years, approximately when the leases on Muny and WAYA end. 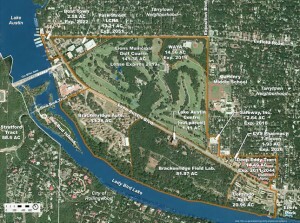 The UT Faculty Council has proferred a master plan of the Field Lab site that we hope to post on this site. It enhances UT’s current facility and creates a wonderful opportunity for community involvement. This master plan for the Field Lab site has not been endorsed, approved or adopted by the University or UT Systems as of yet. However, as it meets many of the objectives we seek for the West Austin neighborhood, the WANG Board of Directors has supported the Faculty Council initiative. Neighborhood Planning did not meet our needs in terms of meshing City planning with Cooper Robertson & Partners’ process. Had the City of Austin told us that it would not allow us to include any planning in regard to the Brackenridge Tract, we never would have endorsed the City’s Neighborhood Planning process. City staff have denied us the opportunity for political reasons. Cooper Robertson & Partners failed to recognize the uniqueness of the Tract and more importantly, its impact on West Austin. If our community input was even considered, it was discarded just as quickly. To compound the challenge that we might face, the University of Texas System, as we understand it, has at least 18 other master plans that have been submitted over the years. Of course, none of these has received any citizen input at all. We, as the West Austin community, have yet to have our thoughts of what the tract could and should be put in the form of a plan for the Board of Regents to consider. We have often communicated what we don’t want – but not what we do – in a comprehensive document. Through April, 2010, we will be combining input and data gathered in Cooper Robertson & Partners process, the City Neighborhood Planning process, and our prior and ongoing dialogue with the West Austin community to put together a cohesive recommendation to present to the Board of Regents. It is our hope that a viable option is presented that they will take into consideration with any future redevelopment of the Brackenridge Tract. Please register and respond to our initial polls. We are trying to get a better understanding of how you shop and eat so that any retail and restaurant mix meets the needs and desires not only of the redevelopment but of the West Austin Community. Thinking about coffee and conversation, how often do you go to a coffee establishment?